Veteran driver Jason Bright has scored his first V8 Supercar race in two years after taking out Sunday's opener at Symmons Plains in Tasmania. Bright's Commodore won the 42-lap run by 3.5 seconds from Holden Racing Team's Garth Tander. Third was Bright's Brad Jones Racing teammate Fabian Coulthard, who won Saturday's first race. Bright's last victory was at Winton in country Victoria in 2011. "It's been too long again," Bright said. "I seem to be putting long breaks in between my wins. "But the car has come out of the box strong and hopefully it will continue for the rest of the year." Bright made a perfect start from pole position and Coulthard slotted into second spot. 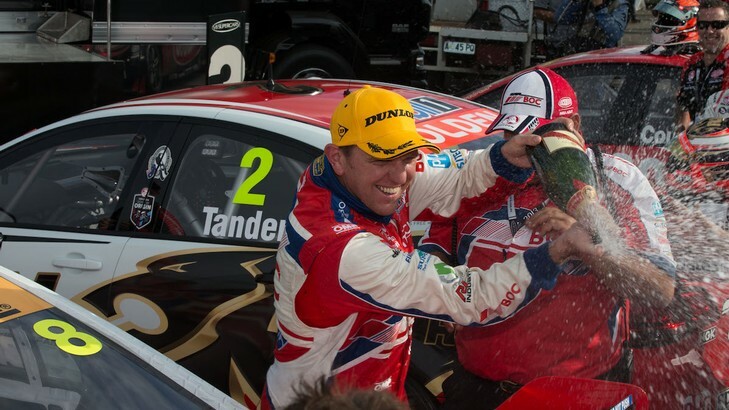 However Coulthard was jumped by Tander on the first lap and relegated to third, one ahead of series leader Jamie Whincup, who finished the race fourth. There was early drama in the first race when David Reynolds' Falcon was slammed into a rail guarding the wall on lap two. At the exit of the hairpin, Reynolds, David Wall and the Nissan of Michael Caruso were three wide and Reynolds was left with no room. The impact ripped the front suspension from his Ford but Reynolds was unhurt. "I ended up hitting two walls for the first time ever," Reynolds joked later. Red Bull Racing's Craig Lowndes, who is chasing the all-time touring car race win record, continued to have a miserable weekend. Lowndes qualified off the pace and took his Holden home in 10th place. Reynolds: "I thought I was going over"